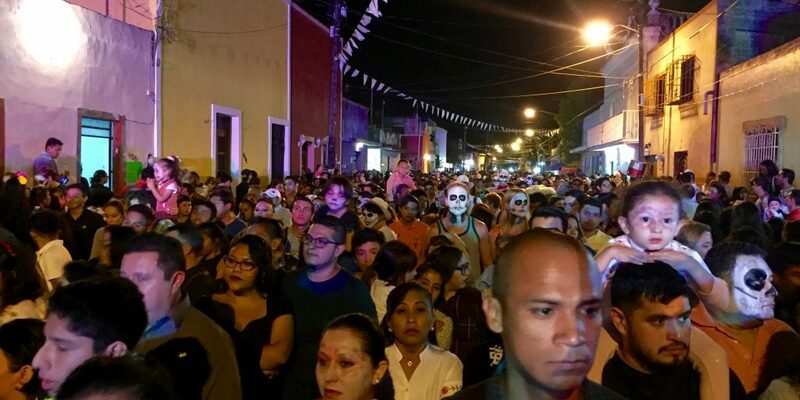 The procession of día de los muertos in Mérida. Paseo de las animas in Mérida. 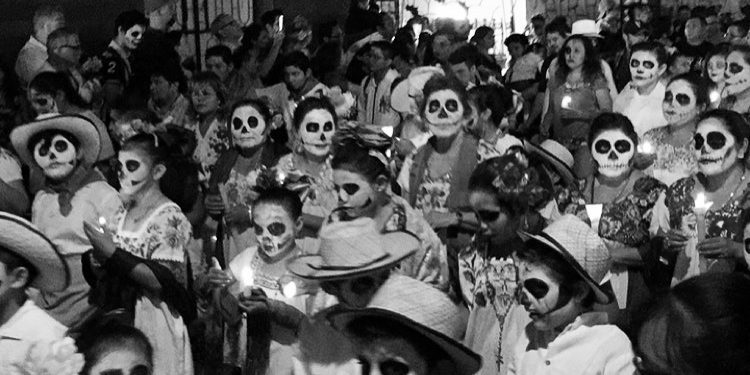 The celebration of the day of the dead in Mérida is the biggest in Yucatan. Hanging out with the locals in Merida. You could get your face painted on the street for 25 pesos. A cemetery on the day of the dead in San Juan Chamula. Since I came to Mexico, one of the most common conversation I’ve had with people I met was where we will spend día de los muertos. The day of the dead is a big deal here. Apparently you want to be around Janitzio, Mixquic or Oaxaca to witness the biggest and most colourful celebrations. My plan was to get to Oaxaca, where I was supposed to meet up with a friend, but then one night I found myself staring at the calendar and counting the days left to November 1st, realising that probably I won’t make it that far that fast. I already completely lost track of time here. Whenever I have to sign in at a hostel and write down the día, mes and año I always pause for a second. I get the year right, but then wonder: is it October? November? September even? Anyway, if you’re in Yucatan, you want to spend the Día in Mérida, I was told. There they adopted more Maya traditions than in the rest of the country and they celebrate Hanal Pixan. I was in Mérida before November 1st, but it conveniently turned out the big procession through the city called Paseo de los Animas was on October 27th already. Perfect! On that day, I met up with a bunch of people from the hostel at the park where the procession was supposed to start. They went there early to have their faces painted as skulls, as one does here. Those who don’t know me: if there is something I dislike, it’s theme parties and dressing up. These people were waiting in line for two hours and got their turn just as I joined them. After Tanya from San Diego repeated a couple of times that it is probably my last chance to do this for día de los muertos in Mexico and the others said I can’t be the only one in a group of eight without a mask, I finally gave in. So we had our faces painted and topped that off with all sorts of cheap and yummy street food: from tamales and tacos to tortas and tortillas to churros and marquesitas. 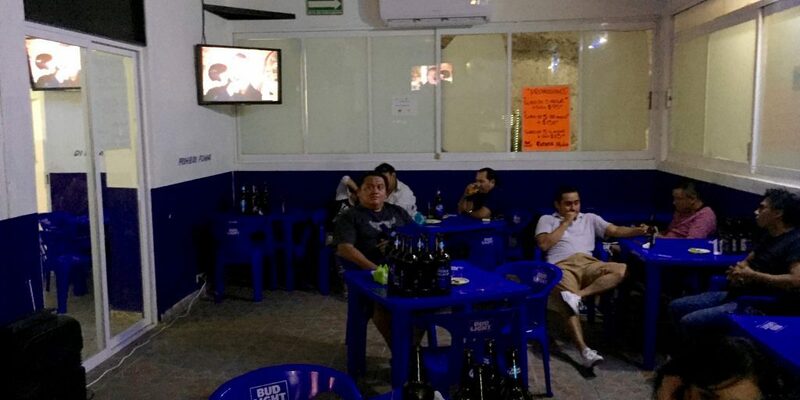 We had chavelas – beer with tomato juice – and surprisingly it didn’t taste half bad. 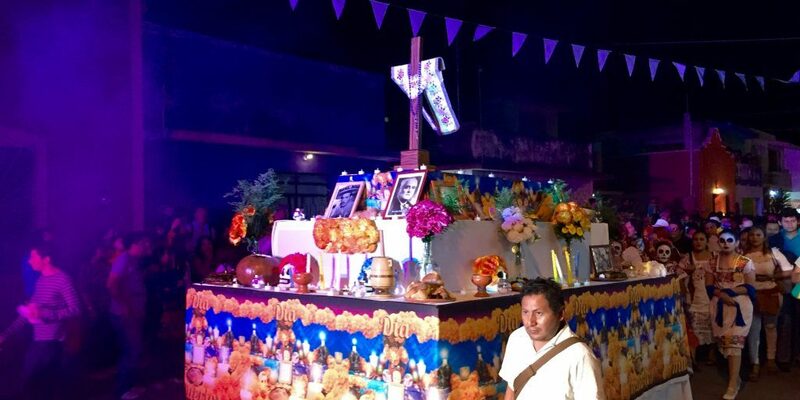 We walked around a bit and passed several “ofrendas” – altars people put up in front of their houses with photos of the dead relatives, friends and even famous people, candles and food. They sometimes sit around them and talk. The procession in Mérida is the biggest in Yucatan. Thousands of people are part of it, dressed in traditional white clothing, with painted faces, carrying candles. They’re not smiling, because you’re not supposed to smile during the procession. A French guy and I had huge problems with this: whenever we were taking a photo and tried to keep serious, we would burst into laughter. The evening itself, however, was a fun event. There were concerts, food, kids running around, blowing soap bubbles in the air. But still it wasn’t crazy, as I’m sure it would be in Europe. There was a certain calmness present the whole night and that made it even more unusual and special for me. 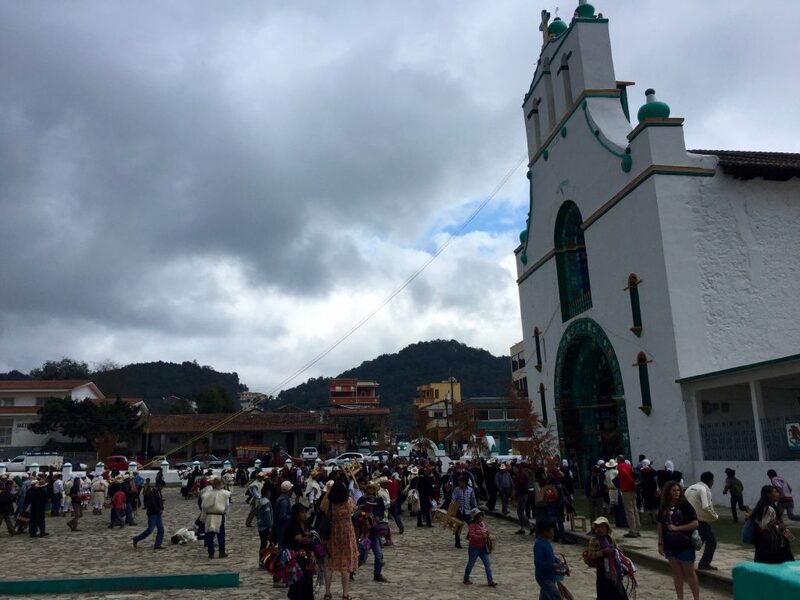 On November 1st, when most cities in Mexico celebrated the day of the dead, I was in a highland town San Cristóbal de las Casas in the state of Chiapas, which made the world news headlines in the mid 90’ as it was the cradle of the Zapatista movement. I saw fewer ofrendas in San Cristóbal than in Mérida, but they were more colourful and special, I guess because of the strong artistic presence in the city. 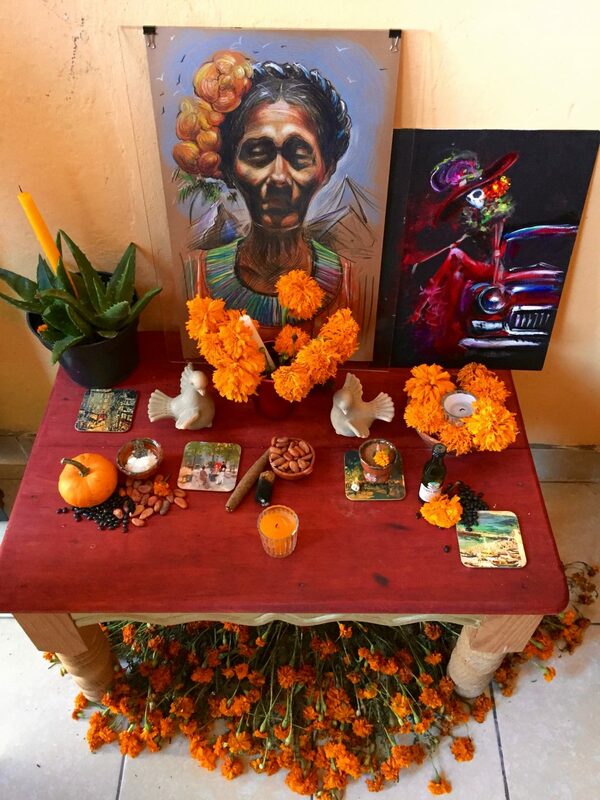 Dia de los muertos ofrenda. On the day of the dead we visited a nearby indigenous town of San Juan Chamula, which is most known for a ritual in which a chicken is slaughtered in the middle of a church as a form of worship. 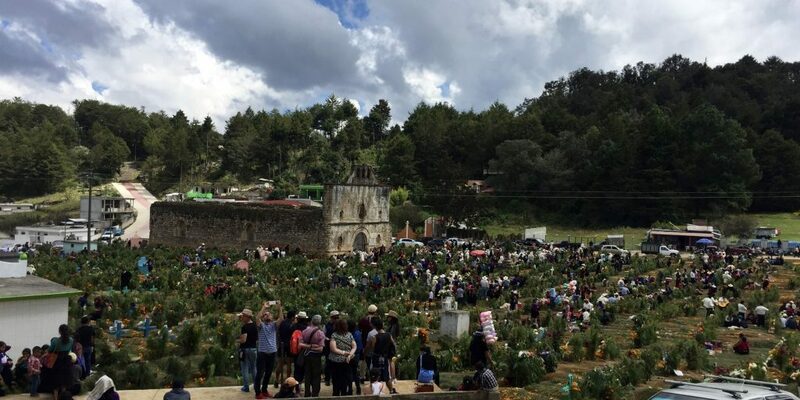 For día de los muertos Mexicans gather at cemeteries, eat, tell each other stories about the deceased and – as we saw in San Juan Chamula – sing! There were mariachi bands going from one grave to another, playing joyful songs and singing. The entire population of the municipality San Juan Chamula is indigenous (Tzotzil Maya people) and speaks an indigenous language. Afterwards we also went to the famous church where chickens die. Tom from my hostel almost had to tackle a drunk guy to get his turn in ringing the church bells, but he made it in the end – proof here. After spending the day in Chamula, I came to agree with what I read about this Mayan town: it is not Mayan really. It is a mixture of indigenous beliefs, whose core was taken by the Christian missionaries, while the local population nevertheless continued to hang on to what they could. Previous Post Street Food: Marquesitas. ¡Qué ricas!